Leinster won the Heineken Cup and Pro14 and Blackrock College won the double at schools level. If the good Lord decided to call me up - or maybe send me down - early I wouldn't have had any rugby excuses to delay my departure. This was as good as it gets. Ireland came third in this year's Championship without even firing a shot. Wales beat Ireland easily in Cardiff and won a handy Grand Slam with a moderately talented but well-motivated side. There is always joy when you win something as prestigious as a Grand Slam but the succinctness and edginess of the Welsh performance told you that they now prefer beating us to beating England on the way to the big prize - they do like to stuff it to us. It added to the sour and congested mood of the country the day after. This is not the time for 2019 to turn into a really bad year. What's coming next? Saracens to win the Heineken Cup? Maybe Scarlets and Cardiff, emboldened by their Grand Slam success, will zoom up the table and qualify to play each other in the PRO14 final after beating Leinster and Munster en route. No, I think the comfort blanket of the provinces can and will save Ireland and its underperforming players. I am always fascinated by this 'try-too-hard syndrome' that gets trotted out on a regular basis. It didn't look to me as if Ireland were trying too hard in Cardiff. The foundation stone of Joe Schmidt's sides has been work ethic and intelligent effort. 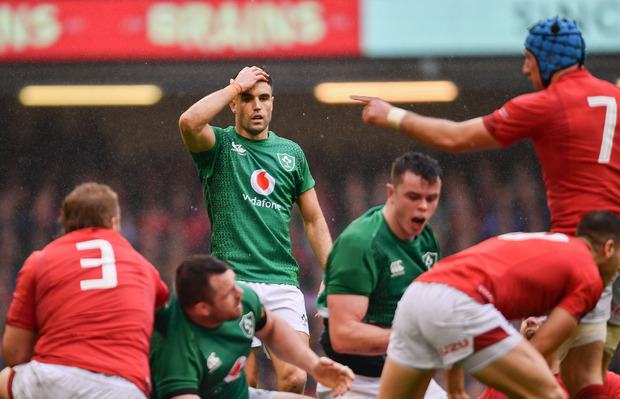 Ireland's effort lacked intelligence, it was clouded by a little bit of performance anxiety and maybe they were guilty of overthinking things a bit as well. Would it be fair to say that Ireland have a dose of the yips at the moment? Normally Ireland are pretty good tee to green but they really did look jumpy on the greens (inside the 22). How many chances did they butcher in the red zone in the 2019 Championship? Everything that is required to get over the line was missing: the ability to take contact on your own terms near the line, passing and retaining under pressure, the ability to think clearly and coolly when there is live ammunition being used and the champions' instinct of taking your chances. Ireland did not possess all of the above when they got into try-scoring positions. Where does the performance anxiety come from? We don't know. We wait for one of the players to break ranks and tell us all that Joe has lost the dressing room or he shouldn't have told us he was leaving. I don't think so. Let's go into the realms of 'what if.' Over the last two years I have watched our two halves play at a level that was sublime. In all the big matches Sexton and Murray played, they won them through their big-game temperament, cold-blooded precision and sheer force of personality. They had exemplar skill levels and always seemed to do the right things at the right time. There was a little bit of ying and yang too as they complemented each other's personalities. If our halves had played to the levels we know they are capable of, Ireland may have won another Championship. If they had executed the game-plan as efficiently as we know they can, that would have had the knock-on effect of bringing everyone else who happened to be playing badly along with them. Remember Ireland had better field position and territory in every game they played - even in the Welsh game. Ireland owned the ball for 88 per cent of the first half against France. It is a simple game folks - if your halves are on their game, then with field position and possession they should press home that advantage. Our halves though had the yips. How can you explain the breakdown in their skill levels? How does the best box-kicker in the world suddenly become distinctly average in this phase to the point that he is just kicking the ball away? The fall-off in Sexton's skill-set was even more alarming. Think of those kick-offs. Were they aimless or just badly kicked? Some of the tactical kicking was poorly reasoned and thoughtless. How can a player of such quality kick with such diffidence when he could do it in his sleep? Place and positioning of the ball is one thing but the actual kicking style was off. The contact with the ball was far from sweet. Sexton knows where to place the ball and how to deliver it to that place but it just didn't happen in the Championship. How many 10-foot putts did Sexton miss? If Ireland had gone 42 phases at the end of the England or Welsh games what were the odds on him getting the match-winner like he did in Paris last year? The underperformance was compounded by Sexton's demeanour - maybe he did miss the angry teenager phase! You can understand why he does what he does. Quite often it is in the sinews of his will that his great performances are fashioned. We need a firewall. So the provinces need to cultivate a recovery for Sexton and Murray, let them throttle back and be themselves again. Leinster's style will suit Sexton as Munster's will suit Murray. The provinces will be the perfect pasture for our 9 and 10 to learn how to enjoy playing rugby again. Great players have the composure to recover themselves. In your own good time lads.